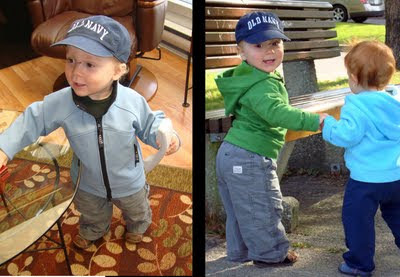 The fit of the softshell jacket (2679) is pretty good, but I forgot to take into consideration that 3 year-olds usually don't wear cloth diapers like he does... So let's just say that he could have used some extra ease at the hem (that is about hip level). As I expected, sleeves are long (I can actually fold the piece I to the inside). 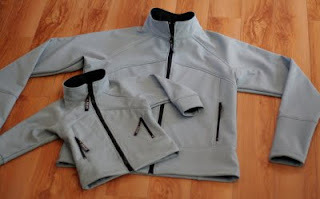 My mom made the cutest little softshell jacket today AND a bigger one for Frédéric (my boyfriend/Henri's dad) too! Frédéric is 6'2" tall, has looong arms and 40" chest so she used Women's Softshell Jacket Pattern 2679 in size Y and lengthened the pattern (pieces B, C, E, F) by 2 inches just below the pocket. She lengthened the bottom part of the sleeve (piece I) by 2 inches. For Henri's jacket, she made size G as is. I can't wait to get home tonight to see how they fit! The fabric is a light blue-grey Power Shield 7796 that we bought from Malden Mills a few years ago. This fabric is 4-way stretch (suuuper comfortable), blocks wind, is water repellant AND very easy to sew! For those who have never seen them, we show how to fix the gap at center back on the 2908 Jeans patterns for a perfect fit. Henri is Growing up Too Fast! After trying this size F pullover (made last year), I think I will have to make the jacket in size G if I want the jacket to be big enough to last more than a week... Since I'm using sweatshirt fleece, it won't stretch that much and since Henri hates tight sleeves (don't ask... he doesn't mind tight pj's, t-shirts or bathing suits though... only tight sleeves!). 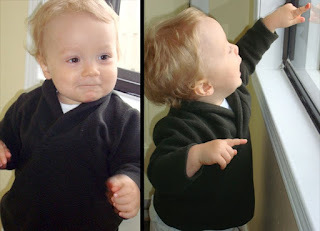 Here is a picture of my not-so-little man wearing the 2911 pullover (view A with shawl collar) made with Malden Mills' Power Stretch in size F. As you can see... The fit is pretty good, but it will be too small in about a month! I have printed out (yes, I know I'm lucky - no need to trace!) pieces to make a 2795 jacket for little Henri who needs something warmer for this weird fall-like weather. Because I don't have much time to work on this project, I plan on skipping the hood and pockets (I don't think he'll notice) ... so it should be quick and easy. I plan to use the gorgeous green sweatshirt fleece I bought in Portland (PR Weekend 2009). Now I have to decide on the zipper color... Same green, darker green, brigther green, white... Any suggestions?